Ten years ago there was a phenomenal surge in interest in masdevallias, partly due to the discovery of new species in South America and to their increasing availability in Australia. But mainly it was caused by the development of many new attractive hybrids, both overseas and in Australia. 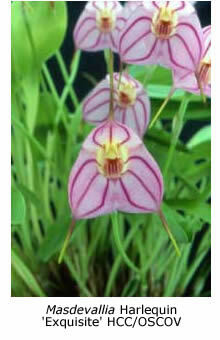 Masdevallias were popular a hundred years ago when about 30 hybrids were developed. 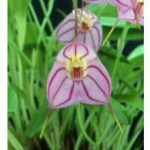 It wasn’t until the 1980s that there was a resurgence of interest in masdevallia hybridising, which snowballed up to the end of the century. Over 200 new hybrids were registered during the 1990s. Interest has waned somewhat today but few can resist the appeal of a specimen masdevallia plant covered with a mass of colourful blooms. Why have masdevallias become so popular? One reason is that they make small, compact, easily managed pot-plants, a distinct advantage for those with limited growing space and a declining interest in repotting huge cymbidium plants. Another important reason is that a masdevallia collection will provide an assortment of colourful blooms every day of the year. Some species flower only once a year, but others have a succession of flowers, while many hybrids flower several times throughout the year. Almost 400 Masdevallia species have now been discovered, most of them in the cloud forests of the Andes in Ecuador, Colombia and Peru at altitudes up to 4000 m. Some grow epiphytically on mossy branches, others on mossy rocks or slopes. Those found at high altitudes experience quite cold conditions, and these can be grown outdoors in Melbourne. 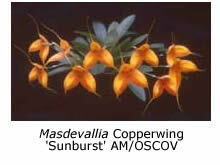 Masdevallia coccinea and M. veitchiana are examples. Others do better in an enclosed shadehouse or glasshouse, where a minimum temperature of 7-10°C can be maintained, although most survive an average Melbourne winter in a ‘cosy’ shadehouse. The main requirement of masdevallias is a humid atmosphere, and a maximum temperature seldom exceeding 25°C. 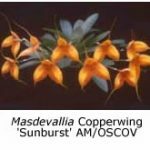 Consistently high temperatures of 30°C or above weaken masdevallia plants, which cease growth and then start to drop their leaves. An evaporative cooler is very useful in summer. Not only does it provide cooling but it simultaneously increases the humidity. The floor of the growing area should be kept wet and frequent misting of the leaves also helps. Various potting mixes have been used for masdevallias. They are probably all suitable, providing that the frequency of watering is adjusted to suit. Some growers use mixtures of pine bark, Sphagnum moss and gravel, but good results are also obtained using moss alone or mixed with polystyrene granules. Repotting should be carried out when the plants are growing actively, but never in hot weather. Occasional fertilising with liquid fertiliser at one quarter recommended strength is recommended. There are so many species and hybrids that it is not possible to list them all here. A few species which grow well for me are M. coccinea, M. veitchiana, M. infracta, M. strobelii and M. tovarensis. Recommended hybrids are M. Angel Frost, M. Sunny Angel, M. Copper Angel, M. Marguerite, M. Falcata, M. Sundancer and M. Pichincha. Some of these are now hard to obtain, except as expensive divisions of high quality clones. By the time a new hybrid reaches flowering size, and its potential is recognised, all available plants have been sold by the hybridiser. Probably the best bet is to buy flasks or small unflowered seedlings. The plants don’t take up much space, and by growing a number of plants of the one cross you increase your chances of flowering one of award quality.